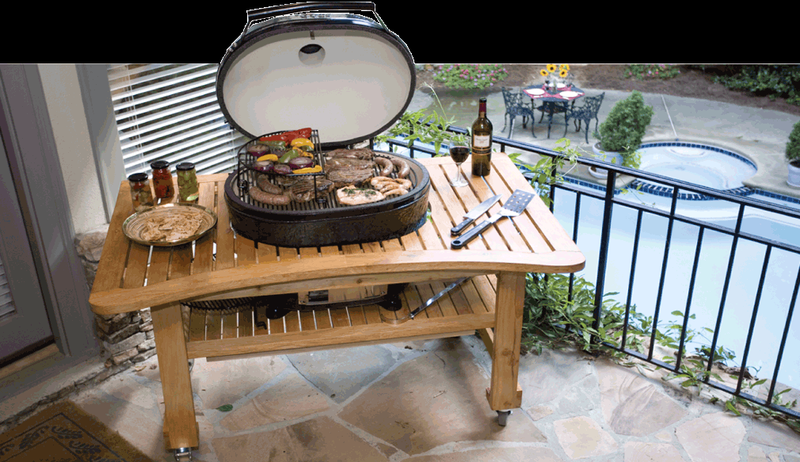 Primo BBQ Grills are made out of the finest ceramic blend for amazing even heat and keeping in the moisture. 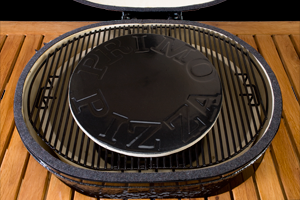 After testing and research Primo have found that ceramic is definitely more efficient than metal BBQs. What this means is that you get better tasting food and more moist food as it takes less air to maintain the even heat required to cook your food. The Primo BBQ will reach temperatures beyond 750 degree (f) / 400 degree (c) which means that you can get a professional steakhouse style seared steak. If you are after a melt in your mouth slow cooked roast or ribs you are in luck as your Primo will maintain temperatures from 200 degrees (f) / 93 degrees(c) for more then 30 hours. Of cousre we definlety recommend that for the best results natural lump charcoal is used so your food will be more flavourful and have no chemical taste. The Primo brand also offers the ability to add wood chips such as hickory, mesquite, apple, pecan, etc to add even more flavours to your food. Primo BBQs reach cooking temperature in as little as 15 minutes and is done so by simply lighting a primo fire lighter and adding it to your natural lump charcoal. Lighter fluid is never needed or to be used with a Primo BBQ Grill. Once done cooking on your Primo simply shut the airflow off and the fire will suffocate itself. The best part is your charcoal will be able to be used again for your next BBQ! Natural lump charcoal produces far less ash than briquettes resulting in less maintenance for your BBQ. The heat of your Primo will burn any grease build up much like a self-cleaning oven does. The exterior of your Primo wipes clean with a damp cloth. 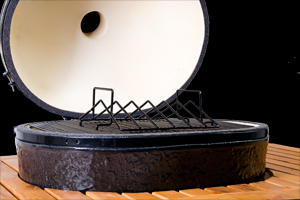 All ceramic BBQ grills are not created equal! Primo takes no short cuts and is made of premium-grade ceramics. 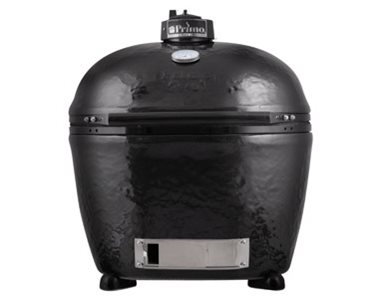 Other “kamado-style” cookers are made of less efficient clay-based material, the Primo is composed of the finest ceramic blend for superior heat and moisture retention. With 60% more efficiency than competing ceramic grills, Primo burns less fuel, reaches desired cooking temperature faster, and allows less moisture to escape, reducing cooking times and producing juicier meat and more falvourful food.